Photo by Petronella J Ytsma. 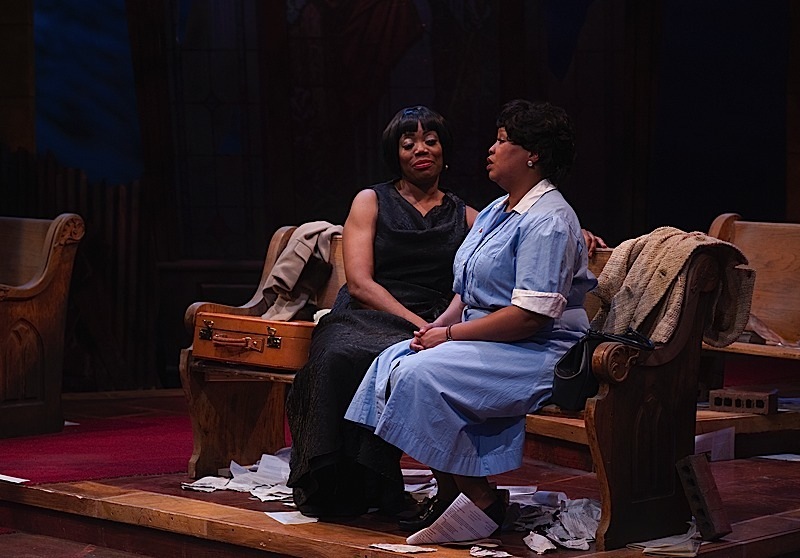 Playwright Christina Ham could have taken it easy and still delivered a strong play with music with Nina Simone: Four Women now in its premiere production at Park Square’s Boss Stage. But she goes well beyond that. Ham brings rich dimension to her dramatic quintet of four different women she encounters in a church in a riot zone. 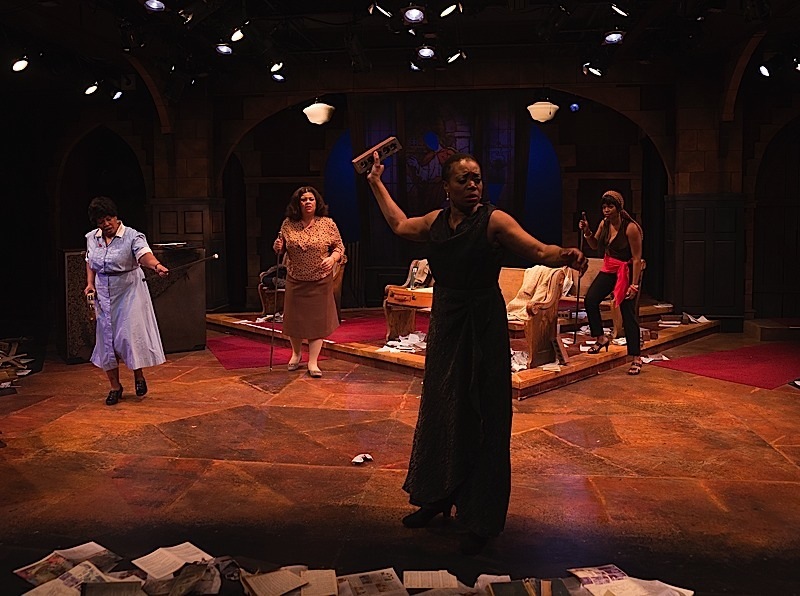 The setting is inspired by the domestic terrorist act in which Ku Klux Klan members exploded dynamite in a 16th Street Baptist Church in Birmingham, Alabama on Sept. 15, 1963. Four little black girls died in the explosion. Ham has imagined four very different women entering the space where Simone sits near a piano. She has begun a new chapter in her life as a politically driven songwriter and singer, rather than the supper club entertainer she had previously been. The role as played by Regina Marie Williams is scathing and powerful. The death of the girls has pricked Simone’s conscience and her focus is now about ending racism, and ending it post haste! One of Simone’s central views was that we wait too long for change, something that comes through loud and clear in the play and the production. Three different African American women enter the zone. They echo very different ideas about identity in the civil rights era. Aimee K. Bryant plays Auntie, a working class woman with strong conservative religious values. Thomasina Petrus plays Saffronia, a woman who has committed herself to civil rights activism. Tracey Allen Shannon portrays Sweet Thing, a young woman who has survived by her sexuality. Director Faye M. Price has elicited sharp-edged performances from all members of this superior cast that crackle off each other like a small bonfire. Sanford Moore’s music direction captures the protest spirit. All vocals are excellent with Williams giving exceptionally fine deliveries of Mississippi Goddam and To Be Young Gifted and Black. The latter tune was inspired by playwright and Simone’s friend, Lorraine Hansberry. One of the many intriguing informational bits within Ham’s music drama is that black women were not allowed to march with the men in the famous civil rights march.